"As the dew is dried up by the morning Sun so are the sins of human beings by the sight of Holy Mt. Kailash and Lake Manasarovar" - - Skanda Purana (Hindu Ritual Text Book) , Kailash is also known as the "Sumeru Parvat"- centre of the universe. "We do not Experiment, We Excel with Experience" : We have leadres that have been to Kailash over 7 times, the trip planner Mr. Rajan have been to Kailash over 14 times in last 7 years, please hear from our clients who have been to Kailash - mansarovar tour with us and how much they enjoyed it with us. 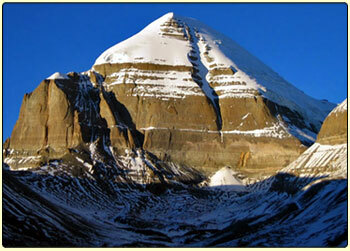 Mount Kailash - The abode of Lord Shiva and goddess Parvati : Mt. Kailash is claimed to be the apex of the Hindu religious axis, is also one of the holist mountains in Tibet . Lord Shiva resides in Kailash among the peaceful Himalayas. A mythological story says that Lord Shiva once built a house for himself but gave it away to a devotee who asked for it. Thus without changing his residence he settled in the mountain of Kailash. This is his abode where he stays with his whole family including his wife Goddess Parvati and children Lord Ganesha and Lord Kartikiya and the other Shiv Ganas (group of Shiva Devotees) like Nandi and others. According to ancient religious texts, the abode of Lord Vishnu is called Vaikuntha, the abode of Lord Bhrama is called Bhramaloka and the abode of Lord Shiva is called Kailash. Of the three, one can only go bodily and return in this life from Kailash having experienced divinity. The Hindus, buddhist and Jains all alike travel to this place as pilgrims. 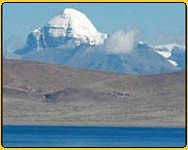 A journey to Kailash mansarovar is considered as once in a lifetime achievement. “I may say from personal experience, that the environments of Mount Kailash are such to liberate one's mind immediately from one's mundane worries and cares and raise it to a wonderful, painless and sorrow less world, fit for gods alone..."
We have the following dates scheduled for this Holy Mt. Kailash - Mansarovar yatra Tour by helicopter 2011, that are guaranteed to operate with a minimum of 14 persons in the group. The tour is also available on a private basis to suit your own dates. The date below to be confirmed at time of booking. *Departure date means arrival in Kathmandu, when 10 or more person in the trip private departure dates available. We have Kailash tour trek available from Limi Valley and Simikot area as well. oceans and continents in order to have a glimpse of the abode of Lord Shiva. Holy Mount Kailash is one of the most popular ultimate Hindu pilgrimage sites in Himalayan region dedicated to Lord Shiva where every devotee wants to go. Mount Kailash, which is believed to have been formed 30 million years ago when Himalayas were in their early stage of formation, is one of the most revered places in the Himalayas. Mansarovar and Mt. Kailash are two of the holiest pilgrimage areas to devotees of Hinduism, Jainism, Buddhism, Bonism and many other faiths. Each year thousands of devotees undertake the treacherous and rigorous journey through the mountains and plains of Nepal and China ( Tibet) to reach this sacred land. Mt. Kailash, 6,740 mtr. high peak is situated to the north of the Himalayan barrier, wholly within Tibet. It is the perfect mountain with awesome beauty, with four great faces. It is the spiritual centre for four great religions: Tibetan Buddhism, Hinduism, the Jain religion and the pre-Buddhist animistic religion - Bonpo. For the Hindus Mount Kailash is the earthly manifestation of Mt. Meru, their spiritual centre of the universe, described as a fantastic 'world pillar' 84,000 miles high, around which all else revolves, its roots in the lowest hell and its summit kissing the heavens. On the top live their most revered God, Shiva, and his consort Parvati. For the Jains, an Indian religious group, Kailash is the site where their first prophet achieved enlightenment. For the older, more ancient religion of Bon, it is the site where its founder Shanrab is said to have descended from heaven. Spread out on the Tibetan plateau beside Mount Kailash is the giant lake of shifting colors - Lake Mansarovar. 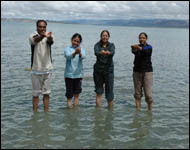 Brahma, the creator, had a mind (‘Man’) for the creation of a lake (‘Sarovar’), hence its name ( Mansarovar). A pilgrimage to Mount Kailash and a bath in the Mansarovar is believed to bring about salvation (Moksha) and washed away all the sins of life. Over the centuries pilgrims have constantly journeyed immense distances to achieve enlightenment or cleanse themselves of sin, braving enormous distances, particularly harsh weather and bandit attacks. People have been visiting Kailash - Mansarovar for centuries. It used to be very hard journey in the past; today we (Earthbound Expeditions) can bring you there with help of Landcrusiors via Kathmandu. So it is lot easy to reach to the heaven now! Many agents claim that they run Kailash trip and in cheap price, but the fact is that only few companies deal directly with Tibet agent and have experience of running Kailash trip. Please consult well and ask many questions before you book the trip so you are charged properly and treated well. So called big companies sometimes don't pay good attention to their clients. You need really good care to complete this Yatra. If you have own group of 6 or more person for kailash tour we may able to give smalll discount for group leader. This is by far the shortest and the most direct approach to Mt. Kailash & is best suited for those on pilgrimage. Specially for Indians and NRI. lease go though the itinerary below. 10 days in Tibet, reach to Kailash - Mansarovar by jeep and back. Welcome to Nepal - Arrive Kathmandu, We will come to receive you at the Airport. Check into a 4 star Hotel. This is group join basis and group size is at least 14 or more people. Airfares from Home – Kathmandu - Home. 4 star hotel accomodation in Kathmandu . Supporting Truck for Luggage.Nepali Team Leader and Supporting Team. Extra cost in the event of landslide for hiring additional transportation Rs. 500 per person. Guesthouses and camping charges in Tibet. Simikot trek permit fee for (Helicopter Tour). Airfare KTM / Nepalgunj / Simikot and Nepalgunj / Kathmandu (Helicopter Tour). Helicopter Charter cost as per program (Helicopter Tour). It is believed that all miseries / sorrows are relieved once you visit this temple (Mukti = Nirvana or status of Liberty / Free, Nath = God). The famous temple of Lord Muktinath lies in the district of Mustang and is situated about 18 kms northeast of Jomsom at an altitude of about 3800 meter. The main shrine is a pagoda shaped temple dedicated to Lord Vishnu. Sets into the wall around it are 108 waterspouts from which pour holy water. The temple is situated on a high mountain range and is visited during fair weather. There are two ways to get to Muktinath from either take a flight from Pokhara to Jomsom and hike for 7-8 hours from Jomsom or trek all the way from Pokhara through Kali-Gandaki valley, which takes 7/8 days. It is believed that one should visit this temple after competing pilgrimage of four special religious sites in India. This temple held sacred by Hindus as well as Buddhists. The Jwala Mai temple nearby contains a spring and an eternal flame fed by natural gas underground. Jomsom is a major center in the Annapurna region. There is a world-class accommodation facility in Jomsom from where one can enjoy remarkable natural beauty. Cost Please ask for the price. Day 03 : Transfer to Pokhara by Tourist Bus & Transfer to hotel. Day 04 : AM: Early breakfast in the hotel, Transfer to Pokhara airport and fly Pokhara Muktinath - Pokhara by chartered helicopter (Round trip flight: 1.5 hours - 2 hr for worship (Pooja) at Temple), Back to Pokhara and transfer to Hotel after fresh-up and start Sight seeing in Pokhara. Day 04 : AM: Early Transfer to Pokhara airport and fly Pokhara Muktinath - Pokhara by chartered helicopter (Round trip flight: 1.5 hours - 2 hr for worship (Pooja) at Temple), Back to Pokhara and transfer to Hotel after fresh-up and start Sight seeing in Pokhara. Day 06 : Fly back to Home. Day 03 : Fly to Jomsom by fixed wing air carft and trek to Mukthinath By horse, overnight in Mukthinath or Jharkot. Day 04 : Early Morning Puja, Hawana, and back to Jomsom by Horse. Day 05 : Fly to Pokhara by fixed wing aircraft, overnight at Hotel or same day Fly to Kathmandu. 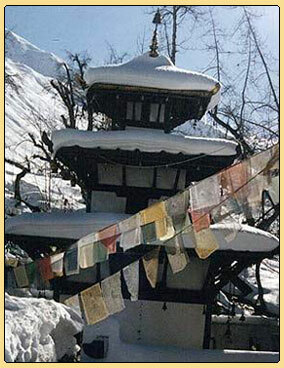 For Muktinath Yatra minimum 15 pax, if less people the cost may revised or we will make you join with larger group.